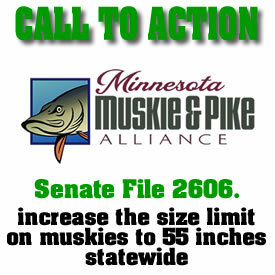 We have Legislation written to increase the size limit on muskies to 55 inches statewide. We need to make calls and send out e-mails to the Environment and Energy Committee; they are hearing the bill on Tuesday, March 18. Senate File 2606. Let them know how valuable Muskies are to us; biologically, socially, and economically. If you have a business that is Muskie related let them know that as well. We have testified in favor of this bill. It passed the sub-committee hearing last Thursday and has moved on. So far the only opposition is the Darkhouse Association. The MN DNR is not opposed and will remain neutral on the issue. The hearing is Tuesday and we need your support today! If you get an answering machine, leave a message. Please make the calls and e-mails. We may not get another chance at this! Please make contact now; and pass it to your friends and family!